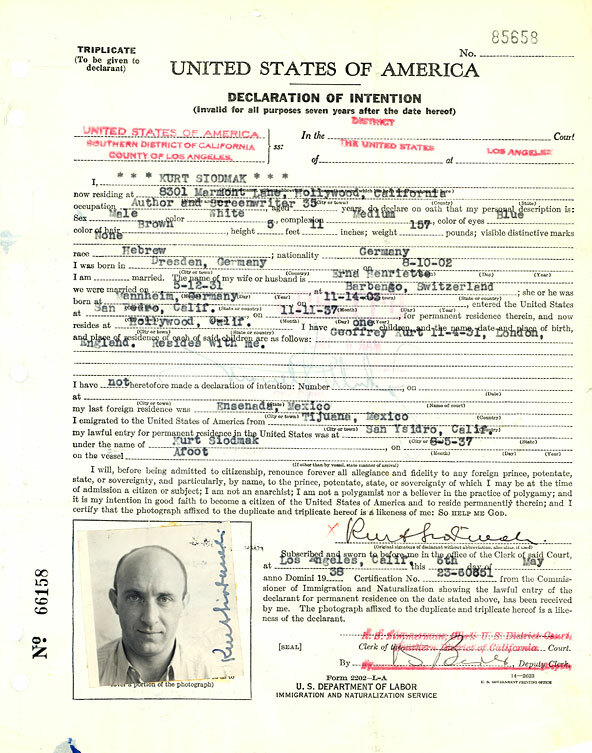 Photo from Curt Siodmak’s application for U.S. citizenship. Born as Kurt Siodmak. Writer. The younger brother of director Robert Siodmak, Curt Siodmak earned a PhD in mathematics before turning to writing novels. The modest royalties he earned were invested in the film, Menschen am Sonntag (1929), a documentary-like chronicle of the lives of four Berliners on a Sunday. Celebrated as a hallmark of neo-realist and avant-garde filmmaking, the film was based on Curt’s own story, and co-directed by Robert Siodmak and Edgar G. Ulmer, with a script by Billy Wilder and Fred Zinnemann behind the camera. Over the next few years, Curt Siodmak wrote numerous novels, scripts and short stories, including the novel F. P. 1 antwortet nicht which became a popular film starring Hans Albers and Peter Lorre. When Siodmak heard an anti-semitic tirade by Goebbels, he decided to emigrate to England. In London and Paris he made a modest living as screenwriter before leaving for the US in 1937. His breakthrough came with the script for The Wolf Man (dir. George Waggner, 1941) which established this beast as the most popular monster of the film industry beside Dracula and Frankenstein. Siodmak’s science-fiction novel Donovan’s Brain (1943) was an international bestseller and adapted for the screen many times. Other important films he wrote include Son of Dracula, I Walked With a Zombie and The Beast With Five Fingers. Though often eclipsed by the fame of his older brother, Curt Siodmak was perhaps the more talented and original of the two artists. His postwar “Epistles to the Germans” remain an insightful commentary on opportunism in Nazi Germany.